This is not a super feminist work, but I don’t always want to review those! With that goal in mind, I want to share “Scary Godmother” by Jill Thompson with you. I have recently been trying out comic books and find I enjoy them, which doesn’t really surprise me. My one complaint about the genre is they are so expensive and I read them so fast! I started with X-men, but that has been so hard to find where to start after so many decades of comics. While I was looking for some X-men comics and being thoroughly confused, my eyes fell upon “Scary Godmother” and fell in love. The volume I have now is, I suppose, the second one, but it is barely even noticeable. The basic idea is that Hannah, a human girl, finds her way* to the Fright Side and Scary Godmother. 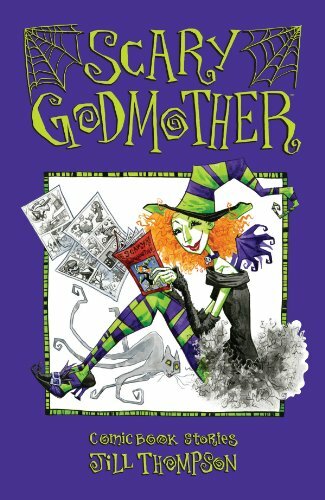 Scary Godmother is, well, a fairy godmother that seems to be infused with a healthy dose of Halloween Witch (her origin story is told in here!**). There are all sorts of Halloween beasties that live in the Fright Side. There are vampires, a skeleton that lives in the Scary Godmother’s closet, a under-the-bed monster (whose parents don’t approve of his job), a werewolf, vampires, of course, and many others. Each comic is about one of these character’s hijinx which inevitably involves the Scary Godmother. Each comic even comes with a snack recipe! I definitely plan to make the Swedish Spiders (page 55). I absolutely love these comics. They are really cute stories and hilarious drawings. The characters are so much fun! I love how Jill Thompson does not make the Scary Godmother the fix-all. Sometimes she screws up and someone else saves her. I really do not know how I can give it enough of a glowing recommendation. It is just too brilliant. The only things I can even think to complain about is that the comic was in black and white, but there are some color pictures in the back, and I wanted more***. The black and white worked, though, so it is only a minor complaint bordering on an observation. There are two things that I think are relevant to this blog, other than my desire to write about it. Those are that this is different from a traditional take on fairy godmothers and a positive portrayal of a witch (sort of). As for a different godmother, this is great for a girl who never wanted to be a princess! It would be awesome to have a fairy godmother and not have to deal with the ridiculousness of royalty being thrust on you. Here’s a fairy godmother for those of you not so in love with a want waving grandmother singing “Bibbdy-Bobbidy-Boo”. Not to mention having a best friend who could let you play with bats would be a dream come true! I know that Scary Godmother is not completely a witch, but I think she is close enough. She does have a number of the stereotypical witchy things, like a cat, broomstick, potions, etc. However, she uses them to help the residence of the Fright Side and Hannah, not run around cursing people’s cows, crops and children. She is more of a traditional wise woman figure (what a lot of witches would prefer to be seen as), than she is the green faced hags you see at Halloween. There is certainly no mention of the devil or even and demons. Even though she is not really related to the modern real world witches, she is still a positive character who is broadening what people think of when they think of witches, which is certainly a positive thing. It is also nice to see a take on vampires that is clearly modified from an old version. Not like Twilight, which is clearly an adaption on an adaption on another diluted adaption. For anyone who likes or does not like comics, I recommend this. If you like Halloween, silly stories or cute drawings this is definitely worth a look. For those of my friends who may have a collection of “witchy” things, this is definitely worth a look. I could not put it down, which I have not been able to say for awhile, unfortunately. *This is the only thing that is slightly confusing. How did she end up there? I believe that is explained in the earlier volume, but not knowing does not affect your enjoyment. **I absolutely love origin stories. If I like the character, then I want to know every interesting thing that ever happened to them ever. That’s why the first comic I bought for X-men was X-men Origins. ***It is a good 300 pages long and contains 5 comics, some multi-parted, so don’t think you are actually getting cheated here. This entry was posted in review and tagged bat, book, comics, fairy godmother, jill thompson, review, scary godmother, skeleton, the Fright Side, tom boy, vampire, werewolf, witch, witches, x-men. Bookmark the permalink.